at supporting our youngest residents in a commitment to help ensure that all Somerville students are Kindergarten ready. 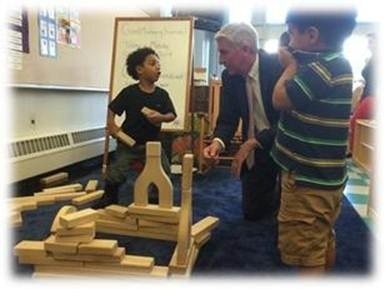 This bold initiative, made possible by Race to the Top – Early Learning Challenge Grant funding from the Massachusetts Department of Early Education and Care (EEC), and the commitment of early childhood partners across the City, has continued to evolve and expand. What began as a pilot effort that focused on understanding Somerville’s existing early childhood mixed-delivery system and its needs, and bringing partners together for joint professional development, has evolved in two years into a robust initiative. That initiative includes the hiring of a full-time Early Education Director, the launch of the Healey Head Start Pre-K – a full-day classroom at the Arthur D. Healey School staffed by a Somerville Public Schools teacher and a CAAS Head Start teacher, a full-time Early Childhood Literacy Coach, and continuing targeted joint professional development opportunities. In addition, as part of its early grant-funded work, Somerville is set to launch a new online website resource – the Somerville Early Childhood Hub – in the next few weeks. The focus is on alignment of Somerville’s early childhood mixed delivery system, bridging public school and community partner programming to support consistent, rich experiences for young children. Initial early childhood efforts have been guided by Somerville’s Early Childhood Advisory Council (ECAC) and the RTTT-Early Childhood Grant Steering Committee that includes representatives from the Somerville Public Schools, CAAS Head Start, Tufts’ University’s Eliot-Pearson Department of Child Study and Human Development, SomerPromise, Somerville Family Learning Collaborative, Capuano Early Childhood Center, and Open Center for Children. Lisa Kuh, Somerville’s new Director of Early Education, will lead this effort and will look broadly at programming for young children across the city, visiting as many programs as possible over the next months. She will be asking teachers, families, and community members to think about the practices that support rich learning experiences for children in and out of school. In addition, she will be working directly with teachers across the city to support their work in classrooms. Early childhood teachers in Somerville will continue working together, as they did last year, to visit each other’s classrooms, learn new ways to support literacy, create opportunities for children to engage in learning through play, and share best practices. Coaching has proven to be one of the most powerful ways to build innovation and to bridge the achievement gap. The addition of a full-time coach who will work with early childhood programs and public schools in the City, supports a focus on readiness for kindergarten. The Coach will work with the Director of Early Education and with the Somerville Public Schools K-8 Curriculum Coordinator to develop opportunities for teachers to fine tune and share practices related to literacy and routines that promote independence, creative thinking, and social skills. Follow Somerville’s Early Education progress at http://somervilleearlyeducation.blogspot.com. The blog will highlight home-school connections, innovative practices in Somerville, important policy information, and resources for teachers and families. The Somerville Early Education (SEE) Pinterest board (http://www.pinterest.com/spschools/see-somerville-early-education/) offers great ideas for school, and for home. Somerville Food and Nutrition Services celebrated Massachusetts Farm to School Week with our annual Corn Shucking at Breakfast tradition on Thursday, October 2nd. Massachusetts Farm to School Week is an opportunity for schools across the state to celebrate the local harvest season. Students across the District were hard at work early in the morning to get 3,500 ears of local corn from Verrill Farm in Concord, MA shucked so that fresh corn on the cob could be served at lunch that day. Hundreds of students as well as countless volunteers, parents, teachers and staff members joined together to get this mammoth task achieved before the first bell! This event brought together students from all grades as well as students with varied levels of corn shucking experience. Older students enjoyed the task as much as the younger students, and were able to help younger students get the first difficult husk off the corn. Many students have participated in the event in past years and are veteran corn-shuckers. Others have shucked corn but only in their home country. And still for others, this was a first-time experience and was a special opportunity to learn where corn comes from. On Wednesday, October 8, 2014 Somerville High School students gathered for the first time in 2 years in their beautifully restored school auditorium to hear a compelling story about a high school student whose life and death has inspired millions. Somerville High School and the Somerville Office of Prevention teamed up to bring Rachel’s Challenge to SHS, building on the school’s commitment to creating a positive, welcoming and supportive school culture for all students. Rachel’s challenge is a movement and a non-profit organization based on the life and writings of the Columbine High School tragedy’s first victim, Rachel Scott. Their mission is to “…motivate and equip students to start and sustain a chain reaction of kindness and compassion that transforms schools and communities.” SHS students accepted the challenge to (1) look for the best in others, (2) dream big, (3) choose positive influences, (4) speak with kindness, and (5) start your own chain reaction. Rachel’s Challenge’s message is clear, and best summarized in an essay by Rachel herself shortly before her death: “I have this theory that if one person can go out of their way to show compassion, then it will start a chain reaction of the same. People will never know how far a little kindness can go.” The event culminated with Somerville High School students demonstrating their commitment to the Challenge by signing a Rachel’s Challenge banner. Somerville High School students are starting a chain reaction. To learn more about Rachel’s Challenge and starting your own chain reaction, visit www.rachelschallenge.org. Somerville High School Career and Technical Education (CTE) students recently unveiled a metal gate that will welcome guests to Somerville’s South Street Farm community garden. The project, an artistic metal gate at the entrance of the garden, was a joint effort by SHS and Groundwork Somerville (www.groundworksomerville.org). Students fabricated the gate using a computer numerical plasma cutter for the metal fruit & vegetable cut-outs and the lettering. They also used welding techniques learned in class to fabricate the structure of the gate. The project was a collaborative effort by the Junior and Senior classes, and students were excited that the project would be enjoyed by the Somerville community. Somerville High School students were the first to enjoy their newly restored high school auditorium, which re-opened on Wednesday, October 8, 2014, just in time for an afternoon presentation by Rachel’s Challenge. The Auditorium had been shut down since October of 2012 after sustaining significant damage from Superstorm Sandy. Repairs to the Auditorium included the installation of new curtains, sound system, seats, elevator, lights, carpet in the aisles, and heat; refinishing the original floor; and overall cleanup and painting. The result is a beautifully restored school auditorium and showcase community gathering place. The 2014 HONK! Festival, a weekend of activist street band performances, parades, and action invites you to join the celebration this weekend in Somerville. Stop in at the East Somerville Community School Friday at 3pm for a performance by New Orleans’ Red Flame Hunters (http://www.redflamehunters.com/red-flame-hunters-youth-indian-tribe.html). For a schedule of events and additional information about HONK! 2014, visit http://honkfest.org/. Somerville’s final SomerStreets event of 2014 takes place from noon to 4:00 p.m. along Somerville Avenue from Washington to Lowell Streets. The annual Monster Mashed-Up @ SomerStreets includes a costume parade, power tool pumpkin carving by artists, Oktoberfest, Milk Row Cemetery tours, live entertainment, a craft fair and other great family activities including a cool costume exchange. The event is free and open to residents of all ages. Get on board the M.U.S.C.R.A.T. Storytelling bus at this year’s Monster Mashed Up and take part in phase one of what will be an ongoing, citywide oral history project. Somerville Cable Access Television (SCATV) is teaming up with the Somerville Arts Council to gather stories about Union Square and Somerville Ave., then and now, from noon to 2:30 p.m. Stories will be shared with the public via videos that will air on SCATV and will be available as short videos on SCATV and SAC websites. For more information please contact Erica Jones SCATV, at scatmem@rcn.com. For more information about Monster Mashed-Up, including road closure and bus detours, visit www.somervillema.gov/somerstreets, or contact Carlene Campbell-Hegarty at (857) 523-9017. Friday-Saturday, October 10-12, 2104: HONK! Fest 2014. “A festival of activist street bands.” For a schedule of events and more information, visit: http://honkfest.org. Saturday, October 25, 2014: Tufts University’s Halloween on the Hill, offered by the Tufts Leonard Carmichael Society. Annual celebration for Somerville and Medford students in grades K-2 held on the Tufts University campus from 10:00am to 3:00pm; registration starts at 9:30am. All students must pre-register by Sunday, October 19th, in order to participate. To register your child, go to https://sites.tufts.edu/tuftslcs/ and click on the “Halloween on the Hill” tab under Programs. Students will tour a haunted house, watch a fun-filled show, participate in Halloween-themed crafts, and more. Snacks, but not a full lunch, will be provided; please send your child with a bag lunch. While most activities will take place indoors, children will be outside. Please make sure your child has appropriate outerwear. Arts at the Armory “Youth Arts Arise.” Arts at the Armory is offering a free afterschool arts program for youth ages 11-19. Local artist instructors will lead workshops in a wide range of disciplines in visual and performing arts. Fall semester runs from October 7-December 16, every Tuesday from 3:30-5pm. An additional workshop will be offered every Monday from 3:30-5:00pm starting November 3. The program is free but advance registration is required. Registration forms available at www.artsatthearmory.org or in person at 191 Highland Avenue, Suite 1A. Older youth have the opportunity to earn a stipend of $16 per workshop to assist the artist instructors. Contact Bridget Galway, education@artsatthearmory.org or (617) 718-2191, for more information.